The item Franklin and the Turtle Lake treasure, Alphanim ; Nelvana Limited ; Cofinova 2 ; Cofimage 16 ; Treehouse ; YTV Canada, (electronic resource) represents a specific, individual, material embodiment of a distinct intellectual or artistic creation found in Austin Public Library. A quiet summer playing pirates takes a surprise turn for Franklin with the appearance of his world-traveling Aunt Lucy and her adventure-seeking goddaughter, Sam. 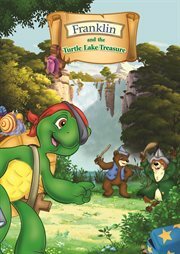 A mysterious treasure map leads Franklin and his friends to Turtle Lake on a quest to find a long-buried talisman he hopes will cure his ailing Granny. Along the way, the adventurers enlist the aid of three unlikely allies: wise Old Turtle, the mischievous Little Crow, and great, grumpy mountain bear, Mr. Grizzly. With their help, Franklin unearths a lost treasure... and in doing so, discovers the true meaning of family and friendship! Join everyone's favorite turtle on an exciting adventure, full of twists and turns, as he learns that 'X' doesn't always 'mark the spot' and treasures sometimes aren't what they seem..